Ordering an Uber to get around is now a no brainer, but ordering an Uber with little kids in tow is another story. Too often we are asked if children need to be in a car seat when in an Uber or Lyft (our answer is ALWAYS YES!) as it is never a simple procedure to deal with installing and unstalling (let alone carrying) car seats. While Uber and Lyft both have services that now include car seats in the car and other rideshare companies have designed their entire fleet to be family friendly, you still may find yourself in an area where neither of these options are present. We suggest checking our RideGuru Fare Comparison to see if a child-friendly rideshare service is available in your area of travel and if not, or if you travel quite frequently, we highly advise that you check out our list of top travel car seats! 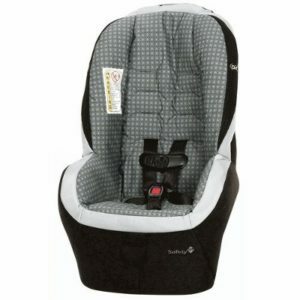 All these car seats are relatively inexpensive, lightweight, and easy to transport! 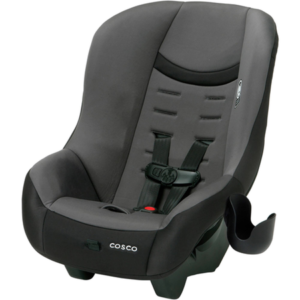 The Cosco Scenera NEXT is affordable, lightweight (less than 11 pounds!) and can be used forward-facing or rear-facing (up to 40 lbs). A bit pricier than the Scenera and with a few more bells and whistles, the Evenflo Tribute weighs just over 9 lbs. The Tribute has a removable head cushion as well as a body cushion, an upfront harness adjustment, and buckle release. 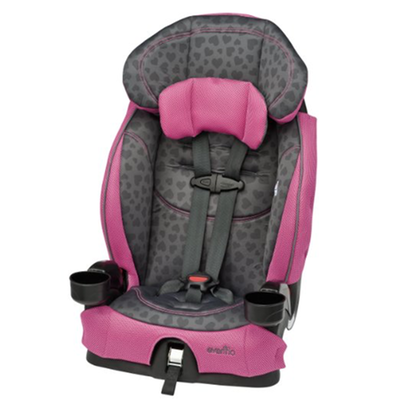 Weighing in at only 9 pounds, this carseat always ranks high for traveling parents. Our final car seat for rear-facing is the priciest but features advanced air protect technology for increased side-impact protection. Weighing in at about 12 lbs, it is also the heaviest but you do receive extra safety for the few extra pounds and dollars! If your child is ready for a forward facing seat (typically around 3-4 years old) the Evenflo line of car seats is our MVP. The first option is the Evenflo Chase weighing in at just 11 pounds, the Chase goes up to 40 lbs in harness mode and 110 lbs in booster mode. The Maestro, also only weighing in at 11 pounds is one step up from the Chase and goes up to 50 lbs in harness mode. If size is your main concern, then the miFold cannot be beat. You can truly fit this in your purse and head out on your way. 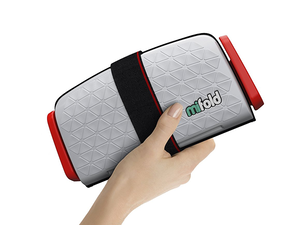 For parents of older children who use rideshares around their city on a weekly basis, the miFold is a must have item. It does taken some time getting the mifold set up, buckled and unbuckled so we recommend playing around with it before using it on your trip! If you are looking for something a little more self explanatory than the miFold check out the BubbleBurm. The BubbleBum is unique in that it inflates (and deflates) when not in use. And don’t worry, it is safe! The BubbleBum can be used for kids weighing 40-100 lbs. It is a bit bigger than the MiFold, but quite a bit easier to use!